The web is an essential platform for business applications. Public websites, intranets and extranets have become de facto standards in communicating a brand, a marketing campaign, enabling social business, keeping employees informed, involved and engaged, as well as securely interacting with partners to exchange product and pricing information or collaborate on a joint development. The key to every outstanding web solution is separating from the crowd and becoming the center-point of clarity for your intended audience. Deliver Faster. Agile development with no waiting for IT, new hardware, or availability of existing dev/test boxes. Cost. Eliminate cap-ex expense and yet build test environments that scale better than ever. Use Existing Tools. Continue using the development languages, tools and lifecycle technologies you are using today. Test Better. Build bigger test environments that simulate real customer load including spikes without resource contention on the cloud’s “infinite” resources. Leave Production Alone. 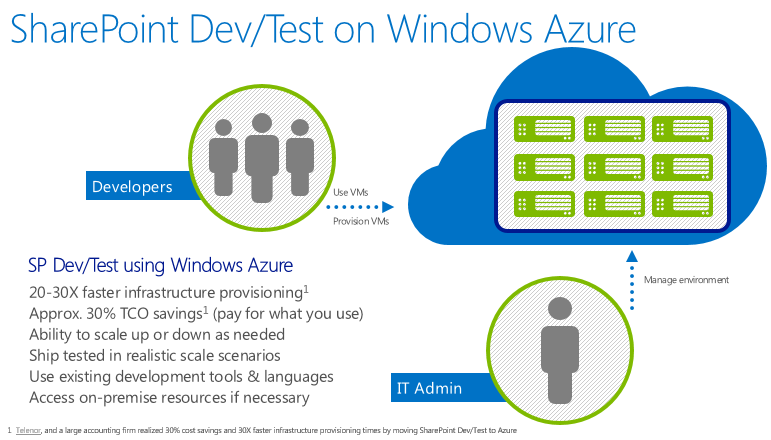 Prevent dev/test apps from affecting on-premise production performance. Even virtualized on-premise test workloads can on-premise production on shared machines. Access Existing Resources - Securely network from the cloud to on-premise to test against systems of record if necessary. Start protecting your business now!